A very contemplative monk of the Grande Chartreuse reads the writings of Elisabeth of the Trinity because they have helped him sustain a life of deep prayer. She leads into theological contemplation. Her spiritual vision combines beautiful doctrine of great mystics, the Sacred Scriptures, and discrete references to her own life experience. She does not present her ideas as an organized treatise. Her thought instead is musical - in fact, it is a lot like 19th Century classical music with intricate interwoven themes repeating in new ways almost rhythmical throughout her reflection. Each beautiful idea is surrounded by contemplative silence. By this, I mean that the words pull one into prayer. Some of those who read her works describe how they cannot read even a full paragraph without being moved to pray, overwhelmed with a longing for the Lord. 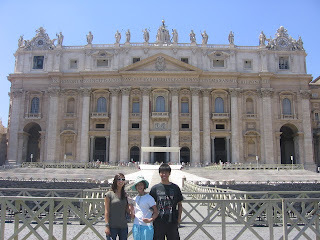 Helping her friends enter into deep prayer is exactly what she believed her mission from God to be. Probably she is most known for her Prayer to the Trinity, a prayer that has helped many contemplatives grow in devotion to the Father, Son and Holy Spirit. This prayer begins with a petition asking the Lord to establish one's own soul in a peaceful stillness. Whenever we forget about ourselves a little and look to the Lord, it is refreshing. And we need this kind of refreshment on a regular basis. Without it, we compromise ourselves in a thousand petty ways, and we feel trapped in our own egos - and this is a foretaste of hell. When we make time for God, allowing our hearts to rest in Him, if only for a few moments, it is refreshing because it is a foretaste of the perfect freedom awaiting us. For this is what heaven is - the state of being where we are completely free to thrive: free of pettiness, pride, anger, and all selfishness, of everything that impedes our ability to love. It is exactly this stillness and peace, this sacred silence out of which love flows, that Blessed Elisabeth is teaching us to seek from God. In today's readings, Peter declares that Jesus is the Messiah. 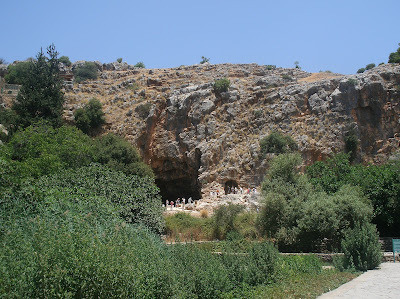 This episode in the Gospel of Mark happened in Caesarea Philippi. Peter's profession indicates that he understood Jesus to be the one who would fulfill the promises associated with the restoration of Israel. The same story, as related in the Gospel of Matthew relates that Peter also declared Jesus to be the Son of the Living God. Jesus confirmed this declaration as a truth revealed by God. Does the context shed light on the significance of Peter's profession? King Herod had built over the headwaters flowing out of Mt. Hermon a statue to Caesar which honored the emperor as a son of god. The placement of this monument would have associated Caesar with Pan, a fertility deity to whom the abundance of life-giving water in that place was attributed. In other words, Caesar was honored as a source of life. And so he seemed to be. All the political, financial and military honor and glory were undeniably his. Those who were his friends flourished. Those who opposed him seem to be opposing the very powers of heaven. Indeed, all the kingdoms of the world were in one way or another bowed down before him. It would have been as difficult then as it is now not to be dazzled, not to look at this temple to Caesar as somehow iconic for the aspirations of mankind, worthy of submitting all of one's life energy to serve. But political systems and ideologies promising salvation have always had this effect on us: they always make a claim for an absolute allegiance of our lives and resources that really ought only be given to God. Ironically and revealingly, in this case, there is nothing left of this monument today except for niches cut into the cliff around the cave where these waters once flowed. Who could ever have imagined that things would change, and that this site would be an almost forgotten footnote were it not for the discussion Christ had there with Peter and the Apostles? Philip's declaration concerning Caesar, based on what he could observe and what seemed to make sense in the world as he imagined it to be, proved to be false over time. But what of Peter's declaration? Against the pageantry and glory of Rome, Peter declared instead Jesus and the Christ of Israel as the Son of the Living God. When he did this, he placed in opposition to the overwhelming political power of his day a poor unknown barbarian teacher from an obscure province with no political, military or financial influence. Following the way of this Christ was the source of true life. The Lord confirmed that this profession of faith was not proposed by any mere man (as was the declarations concerning Caesar) but rather from God himself - whom Jesus reveals as the Heavenly Father. Then, irony points to paradox. After Jesus tries to explain to disciples what it means to be the source of life, Peter opposes Jesus. Jesus declared that he would have to be rejected, suffer and die. This would be the complete opposite of what Peter believed he was professing only moments before. Titles that should indicate divine power, restoration of lost glory, and vindication against injustice; Jesus now interprets in terms of vulnerability, humiliation, and even ignoble suffering unto death. Peter attempts to interceed with him, to get the Lord to change his mind. On this point, Jesus is severe with his disciple, revealing the true meaning of Peter's opposition. He admonishes Peter, the one to whom he had just attributed a revelation of the Heavenly Father, as Satan, an adversary. How paradoxical this mixture of good and evil in the human heart and what an important reminder for all those the Lord has chosen to follow Him, for all those who aspire to serve Him! Encountering the Lord in our own prayer means exposing ourselves to his judgments and revisiting our true motives. We often have that painful realization that there are parts of us that are not godly, that are severely limited by our own broken human perspective. This poverty, this brokeness is why the real adversaries of the Church are not those from without who persecute or reject the faith, but those from within who fear where our faith leads: the glory of heaven is revealed in humiliations, rejection and all kinds of trials which pull the Christian beyond all the natural capacity for love - it is here where every human hope dies that a deeper hope, divine love triumphs. Christian prayer ponders how Jesus not only fulfills the promises of the Scriptures, but also fulfills the needs and longings of every people. How did the Romans know that humanity needs to be understood in relation to the divine? That they saw the need to hold up for worship someone who connects the heavens and the earth suggests that in the hearts of men and women of every culture and historical period there lives some kind of awareness that human existence is meant to be governed by something more than human, something above nature, something divine. Because it speaks to this awareness, Peter's profession is, in a certain sense, the beginning of the evangelization of not only Israel but the whole world. To be fruitful, however, we must not oppose Jesus in prayer. We must follow him by the way not earthly power and influence, but by way of the Cross, and the Cross alone. "He desires that if you see a Sister who is sick to whom you can bring some relief, you have compassion on her and not worry about losing devotion: and that if she is suffering pain, you also feel it: and that , if necessary, you fast so that she might eat." Interior Castle, V:3.11 (translators Rodriguez and Kavanaugh, Washington D.C.: ICS, 1980, p 352). As noted in the last post, the presence of the Lord in prayer is above all performative, a life of love I must live out not only for his sake, but even for my own sake, if I am to be true to my deepest self. This means, if we are not to betray the Lord or ourselves or abandon the One who awaits us with love, we must act on what we know the desires of Christ to be - desires that He discloses to his friends in both prayer and daily life. Benedict Groeschel, in I am with You Always (San Francisco: Ignatius Press, 2010) tells the story of a young Russian atheist named Andre Borisovich Bloom who set out to prove the Christian faith false by reading the Gospel of Mark. Instead, as he came into the first chapters of the Gospel, he noticed a spiritual presence in the room with him. He connected that intensely personal presence with the Risen Christ to whom the Gospel bore witness. This mysterious and spiritual presence, far from condemning him, invited him to live by love, awaited him with love. He knew that the whole meaning of his life was to be found in remaining in that presence, and it was chiefly to this task that he dedicated the rest of his life. He took the name Anthony at his baptism and later, after being made Archbishop in the Orthodox Church, he wrote about this experience and his life of prayer in Beginning to Pray, the book that inspired this present web log. I came across Beginning to Pray as a youth at a summer camp. His reflections validated my own experience of prayer and encouraged me to go deeper and be more disciplined. He especially helped me to see that the Scriptures not only gave an account of what Jesus said and did in history, they also shed light on his risen presence in our lives right here and now in faith's mystery. When we look at prayer this way, it dispels the myth (a myth of satanic origins) that God is some sort of oppressive force bent on preventing us from thriving. Instead, this mysterious presence of Christ makes living by love a beautiful possibility for our lives. The experience of Christ in prayer is not emotional or sentimental, although feelings of devotion and tears of compunction help us cling to Him with greater resolve and determination. His presence is not conceptual or an intellectual idea, although holy thoughts and profound insights often bind us to him with greater intensity, and at the same time, lead to a peaceful inner freedom. The presence of the Lord is deeper than the powers of our imagination and even intuition: it is a presence at the very core of our own being and existence - more present to us than we are to ourselves. St. Augustine describes Him as the Light, the Life and the Love through whom we live and move and have our being. His presence makes possible a life of love. This being the case, the presence of the Lord in prayer is above all performative, a life of love I must live out not only for his sake, but even for my own sake, if I am to be true to my deepest self. This means, if we are not to betray the Lord or ourselves or abandon the One who awaits us with love, we must act on what we know the desires of Christ to be. Through prayer and study over the Sacred Scriptures, through holy conversations and faithfulness to our life commitments, through persevering in love through all kinds of trials and sacrifices, through the sacraments: in all these experiences, the Lord constantly speaks to our hearts, helping us to see what we must do in the present moment, helping us to see how we are to live by love. Anthony Bloom focused the importance of living out the Will of God Christ's presence in our lives makes known. His life is a testimony to this effort. In particular, he understood the words of the Holy Bible to be addressed to us personally, sometimes so directly that they can make our heart burn within us: "These words tell us what we already know from our experience of life, and those are absolute commandments. Those words we must never forget. Whenever we fail to do so, we break our relationship with Christ, we turn away, we refuse the burden, the yoke of his discipleship." Meditations, A Spiritual Journey (Denville, N.J: Dimension Books, 1971) 18. Prayer is a conversation with God. But what a conversation! The Lord has already initiated this dialogue. He has already spoken the first word - even before we make the sign of the Cross. As his Word, already knocking at the door, empties Himself into our heart, we find something beyond words to offer to God. What is the Word that gives us speech, that gives us the confidence to address the Almighty, to entrust to Him our deepest sorrows and joys? The Word is Christ Jesus, crucified and risen from the dead. By the gift of the Holy Spirit, this Word continually comes to us in new ways, ready to shower unique and un-repeatable blessings on us. If we attend to Him with faith, if we cling to Him with our whole being, which means clinging to Him on the cross, we free God to do great things, to transform not only our own lives but through our obedience, the whole world. There is one heart that received this Word so completely that it transformed all of history, saved the whole human race from death and imbued the world with new meaning. She was not only among poor herself, but she was deeply concerned for the plight of those who seemed to have no hope, the hungry, the despised. Her concern looked to God: waiting in hope for his saving action, trusting in His goodness and love. She clung to God with complete confidence. The Lord was drawn to her humble simplicity, a humility that only his grace can produce in the human heart, that the human heart can only receive as it surrenders to his great love. He waited with even greater hope in her, entrusting to her not only his divine plan, but his very self. Her response, her answer in this holy conversation? "Let it be done to me according to your word." St. Augustine explains that she bore Him in her heart even before she bore Him in her womb. St. John of the Cross marvels at how she sees men able to have real joy because, in her Son, God is now able to cry. Heaven declared her full of grace, but her neighbors thought her disgraced. Yet in every generation there are those who call her blessed. She pondered all these things in her heart. Mary's faith in the Lord, a faith born of humble simplicity, deep trust and true hope, a faith filled with love, a faith that constantly pondered the ways of the Lord, this faith is a model for anyone who wants to really pray. It is a living faith that Christ's death on the Cross has opened up for us, a faith entrusted to us, produced in us through the Holy Spirit who overshadows our lives. Such faith takes the holy conversation we have with God far beyond any mere exchange of ideas. We can trust in Him because He trusts even more in us. When we say "yes," when we trust in the Lord, the Word of God permeates our humanity, transforming it from within, making it super abundantly fruitful for great and hidden purposes. It is in the fulfillment of this divine dream we discover the truth about ourselves and about God, truths which both we and God are meant to marvel at together as real friends, a true unity of love, life and light. For our part, we must think on the Lord with the ready obedience of living faith: surrendering every thought to Him, trusting with confident hope that "He who is mighty has done" and will do, "great things." The early Dominicans counted as one of the nine ways of prayer of St. Dominic the practice of sacred study or what could be called, theological contemplation. For St. Dominic, study of the truths of the faith is described as an intense conversation as between friends, and exchange of profound questions and beautiful answers with the Lord. He needed this time with the Lord because he knew that only God himself could sustain him in all the work that was entrusted to him. Meditation on some revealed truth from the Scriptures or as presented by one of the Fathers of the Church would raise his mind to the heights of contemplation where he would find new strength and refreshment, or else find himself pierced to the heart and humbled before the Lord's great love. He was certain of the Lord's presence in this, convinced that this was an intimate and deeply personal exchange. This is because he would understand this pursuit of truth as part of a dialogue with the Lord, the unfolding mystery of his ongoing, daily encounter with Christ risen from the dead. Theological contemplation, seeking to understand and know the Lord in a manner open to an encounter with Him, helped St. Dominic remain firmly in the service of the Lord, and for those who yearn to enter deeply into the silence of God, it is among the most beautiful practices recommended by the saints. This kind of study is not merely an intellectual pursuit - it is aimed at the heart. In fact, the battle for the heart is waged in the mind. If we want to encounter the Lord in a life giving way in our hearts, how we think about God, how we understand our lives, and how we order our priorities must be completely surrendered to the Him. The surrender takes place through an ongoing conversation. He works gradually and patiently to lead us into deeper life integrity. This loving surrender to Christ is what St. Paul calls the renewal our minds, a spiritual way of thinking that allows us to live a transformed life, a life offered to God. To help us have such an encounter with the Lord, the great teachers of prayer in the West discuss three kinds of theological contemplation: they tell us to think about the life of Christ revealed in the Scriptures, to think about the presence of Christ in our own lives, and finally to seek the Lord by considering the truths of the faith revealed by Christ. When St. Teresa or St. Catherine of Siena tells us to think about the life of Christ, they want us to focus on the tremendous love He reveals in everything He did. Everything He said and did has been preserved in the memory of the Church, especially in the Holy Gospels, so that we might know Him intimately in our hearts. The gaze of love on the face of Christ, even at the scourging at the pillar, is a gaze He wants to share with each of us Teresa of Avila suggests. When Catherine of Siena describes Christ suffering on the Cross as the bridge to the Father's love she invites us to a mindfulness of the Lord can be uncomfortable, even very difficult. This is because as we behold his love we are invited and even challenged to go beyond our own indifference, to move from living with a divided heart into a whole-dearted existence for the Lord. Such love is the only way to respond to the love offered to us in Christ. To this end, John of the Cross recommends we study Jesus as a model for own lives - that Christ's total dedication to the Glory of the Father is an inner attitude every follower of the Lord should strive to take on. The saints also encourage us to go through all our memories and seek the presence of God, especially in those painful memories where He seems absent. In this effort, we humbly ask the Lord to show us how He was present to us when we cannot see it ourselves. Catherine of Siena, on this point, insists that self-knowledge is essential if we are to make any progress in serving the Living God. St. Augustine breaks into prayer throughout his Confessions as he shares his memories of the merciful Lord at work in his life even when he was furthest away from God. St. Teresa also encourages this practice as a way of remaining recollected and keeping our hearts open to the mysterious presence of Christ when we strive to pray. She herself experienced in her own search for the presence of Christ in her life a deep stirring of devotion, contrition over sin and a source of strength which opened her to even deeper life-changing encounters with Jesus. Finally, during times of silence, it is also good to think about the teachings of our faith revealed by the Lord, like the mystery of the Holy Trinity or the Incarnation, or the Gift of the Holy Spirit. Looking deeply into the writings of St. Paul or into the life of Abraham or David is also very fruitful. There are so many beautiful connections between the truths that have been revealed by Christ through the apostles in both the Old Testament and the New that one could devote a whole lifetime to finding them and never exhaust what God has made known about Himself. Sometimes, as we marvel at these connections, we experience a deep awareness of the Lord's presence which draws us into a beautiful silence. Resting in such silence, attentive to the Lord and His great love, this is adoration - a deep prayer of the heart in which our whole being bows before the glory of his majesty, and in doing so realizes more deeply its true identity and purpose. Theological contemplation, as a way of deep prayer, takes up all these practices in a manner that is open to the life-changing presence of God. Such contemplation helps us experience the Word of God as something more than merely informative. When we raise up our minds to the Lord like Dominic and the other great saints, God's Word is performative - it leads to action, to conversion, to authentic love. When this happens, our friendship with the Lord deepens and we find within us new capacities to serve Him and those He entrusts to us in ever deeper and more beautiful ways.